Wedding season is in full swing and you've probably starting getting invites in the mail and have RSVP'd ( Or at least we hope you rsvp'd....) to attend the wedding of close friends, family and co-workers. Now, when going to a wedding or any other upscale event sometimes the question comes, What the hell do I do with my Hair?!?! I mean after all you may have splurged (or thrift-ed!) a fabulous dress and shoes, plus a gift for the happy couple. Spending additional money on your hair just many not be in your budget. Fear not, Ms. Vixen is here to help! We've put together some amazing hair inspiration and tutorials for you to wear at your next big event! They are easy, beautiful, can work with almost any hair type, and can be done with hair products you may already own. Updos: You simply cannot go wrong with these classic style but they definitely do not have to be boring. Updos can as be classic or as a unique as you want it to be. The Cinnamon Roll: Find the Tutorial Here. 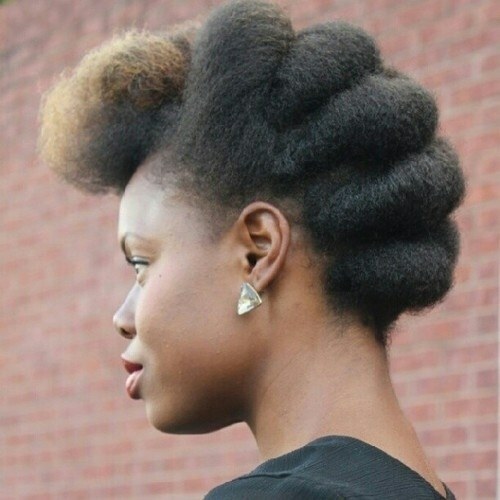 Twisted MoHawk: Find the Tutorial here. Faux Updo: Find the tutorial Here. Bonus this video has 2 styles in it! The Pinned Style: Maybe you don't want to pull your hair up, there a still a bunch of styles for you. The Chignon Head Band: Full instructions here. The Twisted Side Bang Bun: Step by Step here. The Halo: Find the Tutorial Here. Waves and Curls: Simple and Classic sometimes makes a big statement. Beach Waves Find the step by step here. When all else fails accessorize! While these are not tutorials they can definitely give you some inspiration. What are some of your go to styles for your special event?? Let us know in the comment section below! !